Handfasting ceremonies are a popular alternative to traditional weddings. Use this high quality certificate to commemorate the day for the loving couple. The Handfasting ceremony is a traditional Wiccan/Pagan rite of marriage that is often requested of ULC ministers. The ceremony involves the binding of the couples hands and is derived from the practice of shaking hands to seal a deal. 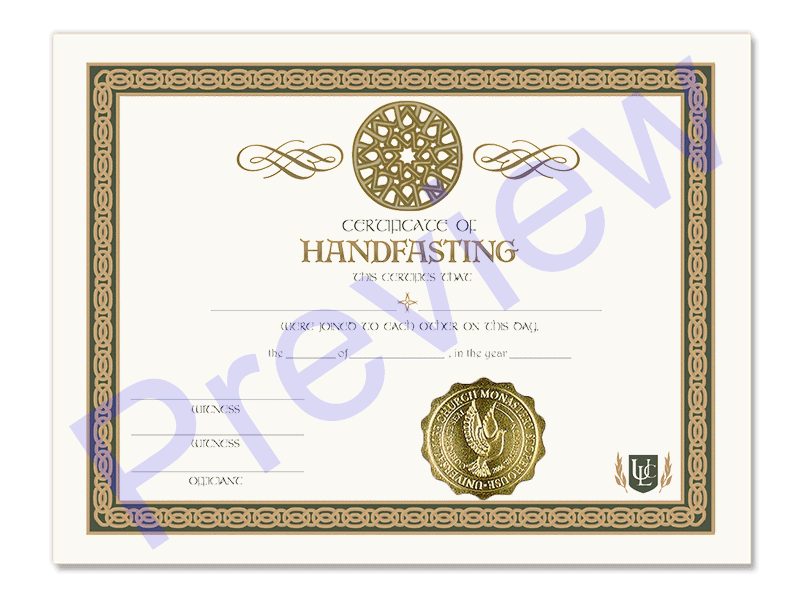 This attractive certificate is printed on high quality paper with the seal of the church included. Mark the special day for the couple by presenting it to them after performing the ceremony. It is a great pairing item to go along with the Handfasting Cord, available in the related products.